Botanical Name: Calendula Officinalis Description: Calendula oil is obtained from fresh flower of marigold and it is also called as marigoldit. It has several species but mainly cultivated is pot marigold (calendula oficianalis). It is probably native to southern Europe. It has been used as culinary & medicinal herb, its petals are edible & are used fresh in salads.The pungent odor of the marigold has been used as an effective pesticide. Extraction: Calendula oil extracted from fresh calendula flowers by the method of Cold Press. Blending: It blends well with cypress, lavender, lemon, frankincense, sea buckthorn & saw palmetto. Properties: It is a Yellow colour liquid with a strange musky, woody & even rotten ordour. Uses: 1.It is mainly used for skin care and it is a great moisturizer for dry skin. 2.It is used to get relief in abdominal cramps & constipation. 3.It is good massage oil and specially for babies. 4.It also helps to treat spider veins, leg ulcers etc. Buy 100% Pure Neroli oil from AG Industries. We are one of the leading suppliers, manufacturers, exporters & wholesaler of Neroli Oil. Description: Herbal Amla is a small to medium sized deciduous tree, 8-18 m in height with thin light grey bark exfoliating in small thin irregular flakes; leaves simple, very many, subsessile, closely set along the branchlets, distichous, light green having the appearance of pinnate leaves. Flowers of Herbal Amla or Indian Gooseberry are greenish yellow, in axillary fascicles, unisexual, males numerous on short slender pedicels. Extraction: This oil is extracted from amla berries through cold pressing. 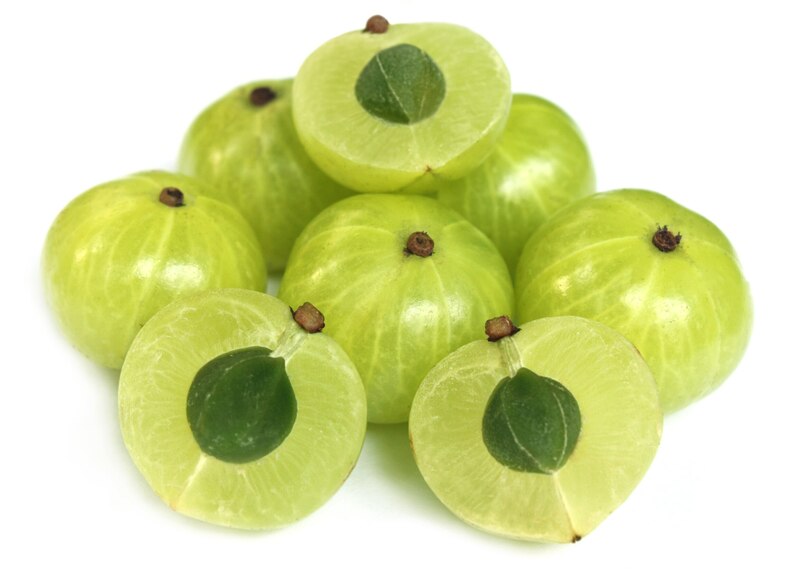 Properties: It has Greenish- yellowish colour liquid with characteristic odor of amla. It has excellent therapeutic values for hair Composition: The major amino acids present in herbal amla are; alanine, aspartic acid, glutamic acid, lysine, and proline, analysis of fresh fruit pulp gave moisture, protein, fat carbohydrates fibre, minerals, iron, niacin, and vitamin fruit ash contains; chromium and copper. Blending: Coconut Oil / Jojoba Oil / Bhringraj Oil / Ashwagandha Oil. Uses: The oil stimulates hair roots and scalp, thus enriching hair growth and pigmentation When applied on scalp and hair, it prevents premature graying of hair, increases the strength of hair follicles and cure dandruff It has a cooling effect over scalp, thus keeps the mind cool and promotes sound sleep Amla oil is also useful for increasing memory. Precautions: The oil is not safe for people with low level of iron and hypoglycemic conditions. People on anticoagulant medications should also avoid amla oil. Description- Avocado scientifically known as Persea Americana belongs to the family of Lauraceae. The avocado tree grows approximately up to 20 m, flowers are greenish yellow and pear-shaped fruit called avocado, large berry containing a single seed. The avocado plant is a native of South Central Mexico but nowadays it is cultivated all over the world. Extraction- Avocado oil is derived from the process known as pressing the fruit. Chemical Composition- Avocado oil is a rich source of vitamin B, C, E and K also it contains Potassium, Minerals, Lecitun and fatty acid. Properties- Avocado oil is edible oils, green in color, with the nutty aroma, waxy feel to the skin. Uses- 1• The avocado oil used to reduce fines lines and wrinkles. 2• Avocado oil used to hydrates and nourishes skin 3• Avocado oil is a key ingredient used in cosmetics as a lubrication. 4• It boosts scalp health so it helps to clear scaly skin and stimulate hair growth. 5• It is used in aromatherapy as it is a carrier for other essential oil. 6• It is used to heal diaper rashes and facilitate healing of wounds and burns to the skin. 7• It is used for skin disease treatment such as eczema and psoriasis. Product specification Botanical Name: Cucumis Sativus Part used: Seeds Color: Colorless to light yellow Description: Cucumber oil is a native of South Asia, but now, it is widely grown in most of the continent. Usually, loam type of soil is suits for the growth of cucumber plant. Cucumber plant is cultivated in India for more than 3000 years. Chemical Composition Chemical constituent of Coriander oil is Vitamin A, Molybdenum, Silica, chlorine, Florien. Blending Cucumber oil can nicely blend with Olive Oil, Vitamin C, and Cucumber juice. Uses: 1.Cucumber oil works as the purifying agent. 2.It is very useful for the treatment of diabetes and stomach ache. 3.Cucumber seed oil is widely used keep skin healthy and young. Product specification Botanical Name: Prunus Armeniaca Part used Kernel Color: Colorless to pale yellow Description Apricot oil is scientifically known as a Prunus Armeniaca. There is no clear information about its origin but earlier it was cultivated in Armenia. Best grown in the cold region. Apricot plant is a small tree with approximately 8 to 13 m tall with the dense canopy. Blending Apricot oil is can mix with other carrier oils and gives a perfect blend. USES: 1• Apricot oil is rich source of Vitamins & Mineral. 2• Apricot oil is useful in the treatment of cancer. 3• Apricot oil helps to control Blood Pressure. 4• Apricot oil makes skin glow and makes it younger. 5• Apricot oil is used in different recopies, in preparing jams and for flavoring liquors. Peppermint oil is derived from the leaves of mentha Piperita by steam distillation of leaves and flowers. Peppermint oil is commonly used as flavoring in foods and beverages, as a fragrance in soaps, formulation of shampoo & conditioners and cosmetics. Piperita is important in Ayurveda and it has also a long tradition of medicinal use Its leaves are often used to flavor tea, foods, etc. across the globe. Extraction: Peppermint oil is obtained by process of steam distillation of leaves. Composition: The active ingredients are menthone (20% - 30%) and menthol (30% - 40%). Uses: 1. Peppermint oil is used to stimulate digestive system. 2. It can be used to cure indigestion and nausea. 3. It is used as a traditional remedy for muscle and nerve pain, headaches, stomach problems, cold and intestine problems. 4. It gives a cooling excitement and has a calming effect on the body which can reduce muscles pain. 5. It can help freshen bad breath and pacify digestive issues. 6. It is beneficial for killing the bad breath bacteria. 7. It is used as a mouth freshener and is a best replacement of sugary chewing gum. Product specification Botanical Name- Lavandula officinalis Plant part used :- Flower Origin – Northern Spain Colour – Clear Pale yellow color Liquid Lavender oil is a multi-purpose oil enriched with linalool and linalyl acetate. Scientifically known as a Lavandula officinal belongs to family of Lamiaceae. Basically flower is native of western Mediterranean and other mountains in northern Spain. The plant is herbaceous & perennial .Color of the flower is blue, yellow or violet. The magical part of the plant is their flowers which attracts others by its fragrance and have been used for making potpourri for centuries. Lavender oil used in making perfume, aromatherapy oil, infusion, oil, body lotion as well as soap with sweetie smell. Extraction:- Lavender oil is extracted by the process known as steam distillation of fresh and dried flowers. Lavender oil is clear pale yellow in color. Chemical composition:- The oil composed with 150 active constituents. Rich in esters and other chief constituents which are linalyl acetate, terpene alcohol, linalool and terpinen-4-ol and camphor, cis-ocimene, 8-cineole,lavandulyl acetate limonene and geraniol. Uses:- 1.Lavender oil can be used as insects repellent and irritation due to bite of bug. 2.It can be used to get relives from pain. 3.Patient who want to enhance the sleeping can used the oil. 4.Lavender oil can be used for the treatment of migraines, emotional stress depression and nervous tension. 5.Lavender oil reduced the red raised sores on face as well on body which is produced by bacterial infection. 6.The oil can be used for treatment of acne, wrinkles and dark circle under the eye. 7.Lavender oil reduced the pain of tense musclesand muscular aches. 8.Lavender oil help to increases the flow of urine. 9.Lavender oil is used for the treatment of hair fall. Product Specifications:- Botanical Name: Argania Spinosa Plant Part: Kernel Extraction: Cold Pressed Origin: Morocco Product Description:- Argania is a flowering plant with single known species Argania Spinosa, and it grows up to the height of 10 meters. Argan tree grows wild in semi-desert soil, which is mainly found in Morocco, due to the small and very specific growing area the oil is considered among the rarest oil in the world and is under the protection of UNESCO. Because of its amazing benefits Argan oil is also called as Liquid Gold. Product Color:- Pale yellow to golden yellow liquid Extraction: In beginning Argan fruit is dried in open and fresh air & then the pulp is removed, after which we crack the argan nut to obtain argan kernels. For Culinary Argan oil gently roast the kernels and grind & finally press them which leads to unfiltered argan oil. The only difference for Cosmetic Argan oil is that kernels are not roasted. Composition: Argan oil consists of Caffeic acid, vanillic acid, Oleuropein, catchol etc. Uses: 1. Argan oil is very effective for the treatment of skin diseases. 2• Because of its high vitamin E &Fatty acid property, the product is given natural boost to skin. 3• Argan oil is ideal for hair conditioner and makes hair softer shinier and silkier. 4• Because of its anti-aging property, help to reduce Wrinkles and make you look younger . 5• Argan oil has to soften properties which help in softening of brittle nails. 6• It’s a complete package of all your skin care problems. GERANIUM OIL Geranium also called as pelargonium graveolens is a flowering annual, biennial or perennial plant, it has cleft leaves, and flowers have five petals & are colored white, pink, purple or blue. Geraniums will grow in any soil as long it is waterlogged. The fruit capsule consists of five cells, each containing one seed. Plants grow 6 inches to 4 ft tall. Geranium is also called as poor man’s Rose. EXTRACTION: Oil is obtained by steam distillation of steams & leaves of geranium plant. Oil is when distilled from young, green leaves it appears with lemon scent and if is obtained from older leaves oil has strong rose fragrance. COMPONENTS: The essential oil is composed of various chemical constituents and includes a-pinene, myrcene, limonene, menthone, linalool, geranyl acetate, citronellol, geraniol and geranyl butyrate. BLENDING: It blends well with angelica, bergamot, basil, carrot seed, citronella, lavender, grape fruit & rosemary oil. USES: Owing to its astringent properties it induces contractions in various parts of body. It tightens facial skin, thus delaying premature ageing. It can be added to baked goods, alcoholic & non alcoholic beverages. Topical application can cause help heal insect bites & stop itching. It is used as massage oil. It reduces pain & inflammation. It also acts as a natural insect repellant. It prevents muscles & skin from sagging. It keeps wounds safe from developing infections. It speeds up healing process of wounds, cuts etc. It helps to diminish scars & other spots. It increases blood circulation. It promotes uniform distribution of melanin. It promotes cell health. It increases urination thus removing toxins from body. Geranium oil is circulatory oil it exits the body during perspiration thus acting as great deodorant. It tones up overall health. It can help in getting rid of intestinal worms. It can treat acne, dermatitis & other skin diseases. It serves as antidepressant. It has positive effect on eczema. Neuralgia burns post menopause syndrome. It is used in fragrance & cosmetics. SAFETY & PRECAUTIONS: It should not be used by pregnant women and those who are breast feeding.